In case you haven't had enough of my diaperless children, I thought I'd write another installment of Pants on the Ground. If you missed the first post about it, you can catch up with Elijah's antics HERE. Last week, I walked into the kids' room to get them up from their morning rest time. They rarely sleep in the morning, but I've found that their morning rest time does wonders for their happiness level and Mommy's sanity. The little bugger had pooped in her diaper, then took it off, then pulled salad-plate-sized turd out, then played with it, and then calmly waited for me to come find it. Her sweet little antics resulted in a head to toe bath, complete bedding change, the entire crib wiped down with Clorox wipes, and a giant load of laundry washed on the hottest cycle available. And since my kids love to do things as a group, Caleb wasn't too far behind (haha!) with his own craziness. 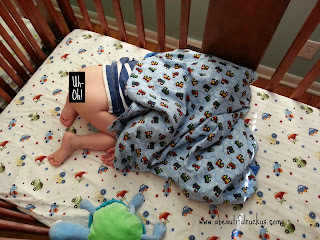 Caleb likes to sleep with the blanket over his head (so weird), but this day he had first removed his pants and diaper. We found them flung on the other side of the room. Apparently, this kid has an arm! The thing that made Sean yelp though, was the position he fell asleep in. He was angled to the door such that...eh, let's just say that nothing was left to the imagination. With those episodes as inspiration, I've developed a new line of fashion accessories for my semi-nudists toddlers. Behold, the Duct Tape Belts! In less than thirty seconds, my kids can now take a nap, wake up fully clothed, and still be trendy. That's right, it's all about staying current and clean. It's a really, REALLY good thing these kids are cute. And it's a really, REALLY good thing that "duct tape fixes everything"...at least until they figure out how to take that off! 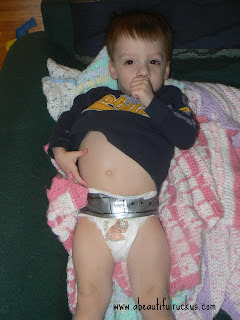 Note: I want to explain a couple of precautions that I take with their duct tape belts. The duct tape is only wrapped around the front of the diaper to cover the tabs. It doesn't wrap all the way around the back of the diaper. I'm also very, very careful that the tape only touches the diaper and doesn't snag any of their skin. Kids have very sensitive skin, so if you choose to help your kids keep their diapers on this way, please be cautious that you don't put the tape directly on any skin. Thanks! Ah yes, duct raid belts. Cassie had to wear one for a couple weeks due to similar turd issues. She seems to be past it now - thank goodness! They certainly keep you jumping. I'm glad to hear that there is hope for my kids! I was wondering if I'd have to tape them until we started potty training. Hmm...I'm going to have to remember that onesie idea just in case the duct tape fails me. I will say that you missed out on some good times...LOL! 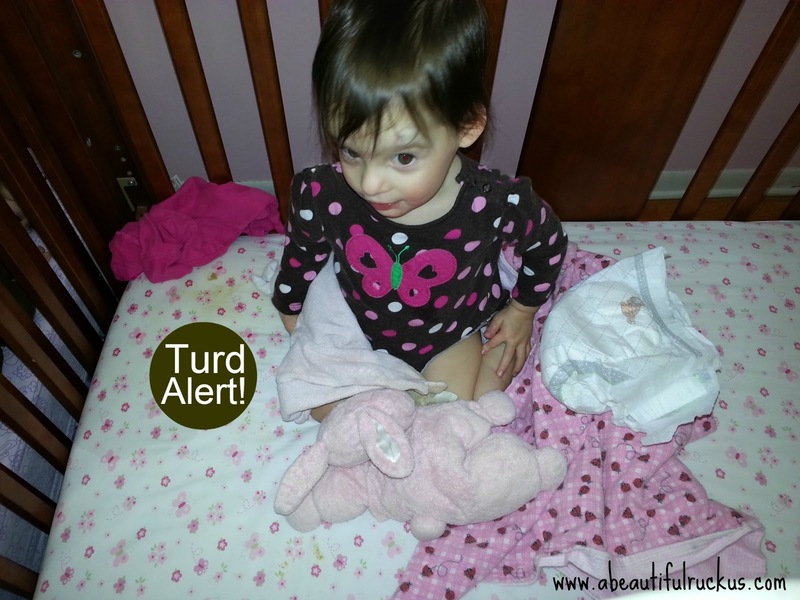 My twins have to wear a onesie or zippered PJs (safety pinned at the top) to bed or they make the grossest diaper messes. We have had to wipe down cribs, walls, doors, carpet, and more so many times. Whoa...walls, doors, and carpet?? That's nuts! I hope we never have a mess quite that big. Gross! Ask Sarah how she's related to Ellie!!!! Duct tape belts: very innovative! This post has me laughing and cringing at the same time :) I really hope that my girls don't figure out how to take their clothes off any time soon! I hope not either, for your sake! After the fact, it's pretty funny, but during the clean up phase....EWWW!! Oh my goodness! The duct tape made my day! I don't often actually laugh out loud, but this was a true lol! Nice post but it is a bit too late for me. My two girls are now 8 and 12. I wish if someone told me this trick when the girls were making it messy for me. Maybe you can pass this tip on to another mom then!